We went to Rye Harbour Nature Reserve a few days ago. It's an easy ramble with bird hides overlooking the lagoons and shingle. 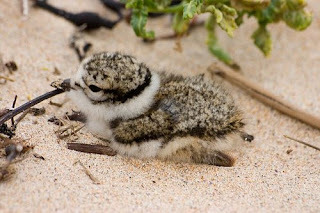 We were lucky enough to strike up conversation with a lady who pointed out a ringed plover and her chicks, they were perfectly camouflaged against the shingle and we would never have spotted them without her help. This isn't my photo, they were too far away for my camera to cope, so with Caroline's permission I've borrowed one from her blog which has many more fabulous photos. 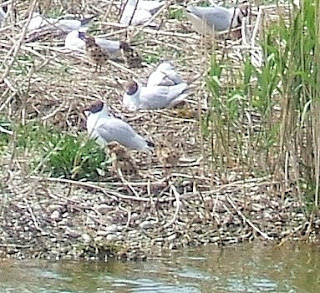 We also saw masses of blackheaded gulls with the most adorable little leopard spotted chicks (which you *might* be able to make out - again, they're so well camouflaged). 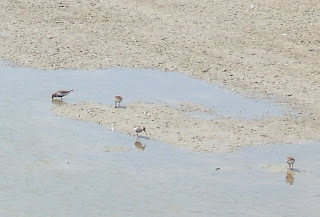 There were dunlins in another of the lagoons. We were really lucky to identify a couple of meadow pippits (have you guessed by now that we had a book with us?) They aren't anything special to look at but have a quite remarkable song flight, soaring straight up and then fluttering down again with legs dangling. If you're after a bird-spotter's guide, we use Collins Wild Guide which is fairly thorough and easy to use. It sounds (and looks) like you had a great day. So much fun to observe the local bird and wildlife. That little birdie is way too cute. I love her/him!!! One of my favourite places. Although I'm always worried that my boys are so enthusiastic that they'll frighten off all the birds and twitchers!